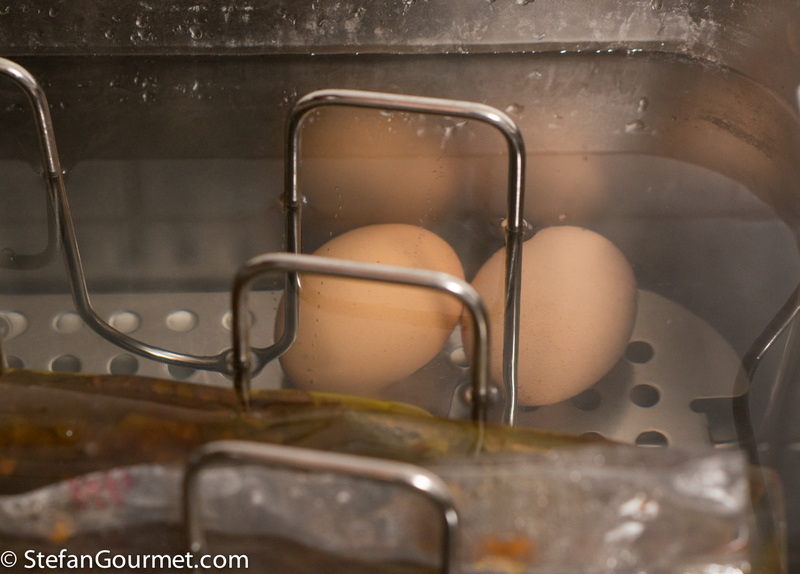 Boil the eggs for 8 minutes, or cook them sous-vide for 1 hour at 74C/165F. I was already cooking some meat sous-vide at 74C/165F, so I just added the eggs. The nice thing about making hard-boiled eggs sous-vide is that they will be solid, but less dry and thus with more flavor than regular hard-boiled eggs. 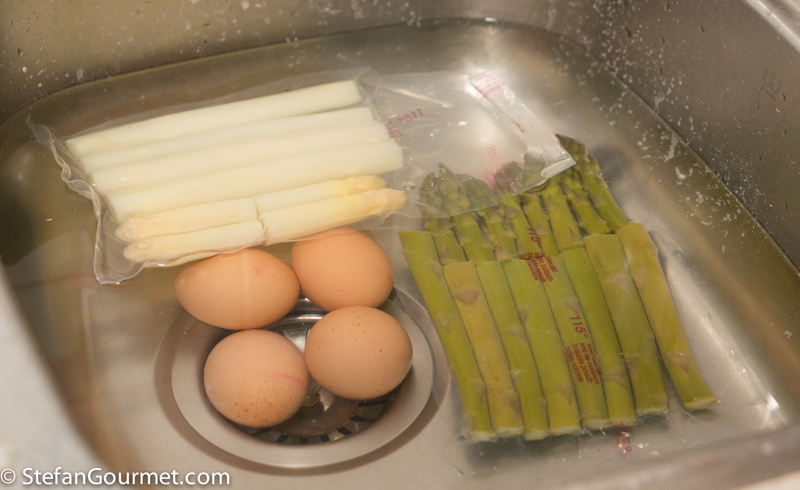 Remove the bottom 1 cm (1/2 inch) of the white asparagus and peel them, except for the tip. Steam them for 20 minutes, or cook them sous-vide for 45 minutes at 85C/185F. Remove the tough bottom of the green asparagus; there is no need to peel them. Steam for 10 minutes, or cook them sous-vide for 20 minutes at 85C/185F. 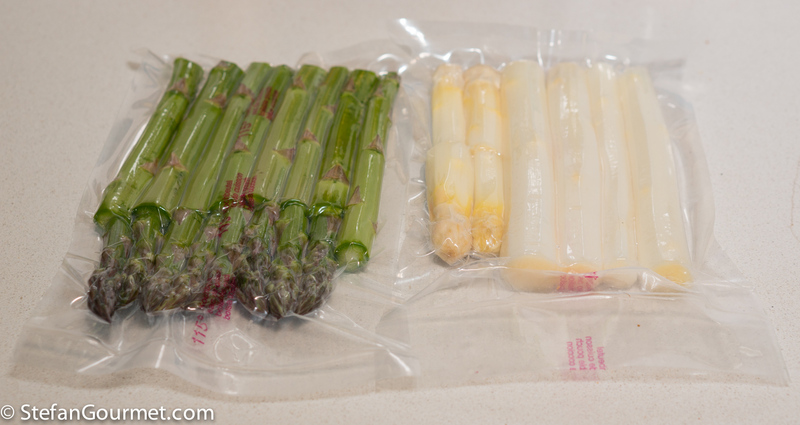 The advantage of cooking the asparagus sous-vide is that they will have a very nice bite to them. 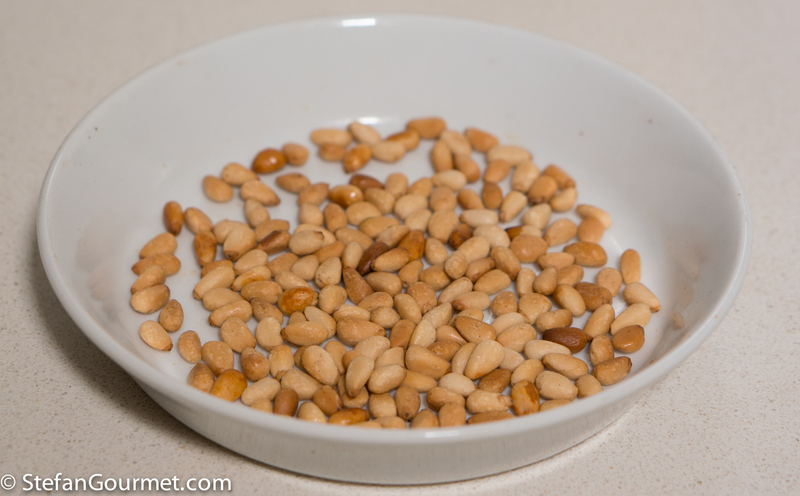 Lightly toast the pine nuts. I find this easiest in the oven, for about 6 minutes at 180C/350F. Reserve the tips of the asparagus and chop the stalks. Peel and chop the eggs. 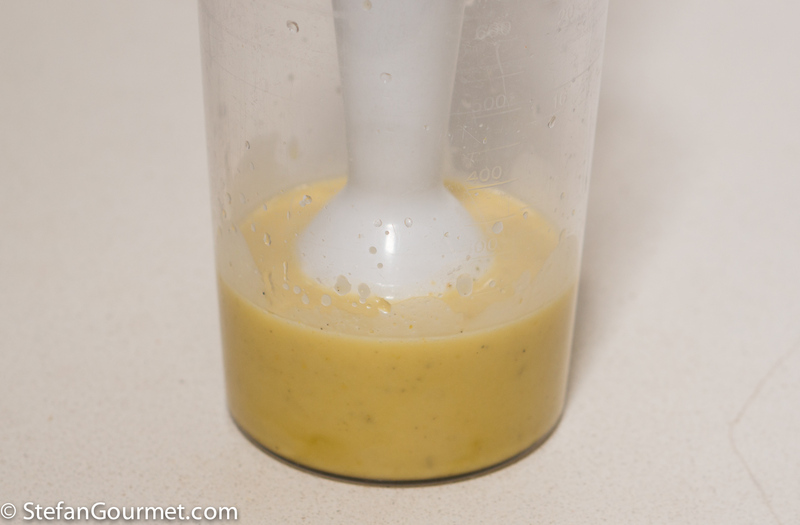 …and use an immersion blender to emulsify. Feel free to use a fork or whisk instead. 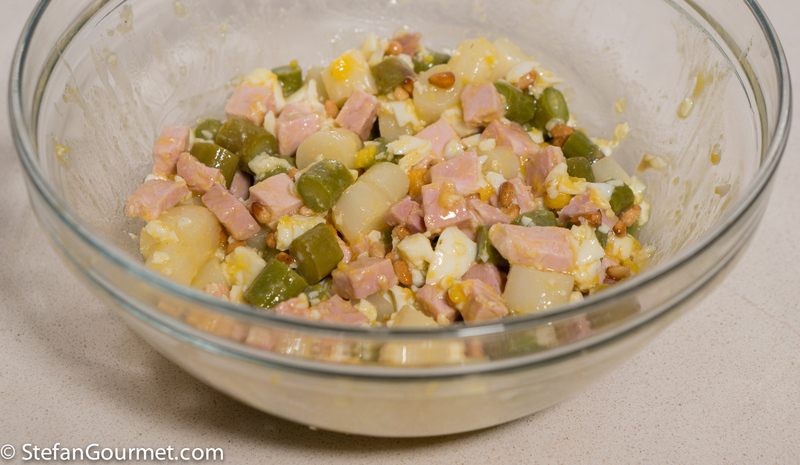 Combine the asparagus, egg, diced ham, and pine nuts in a large bowl. 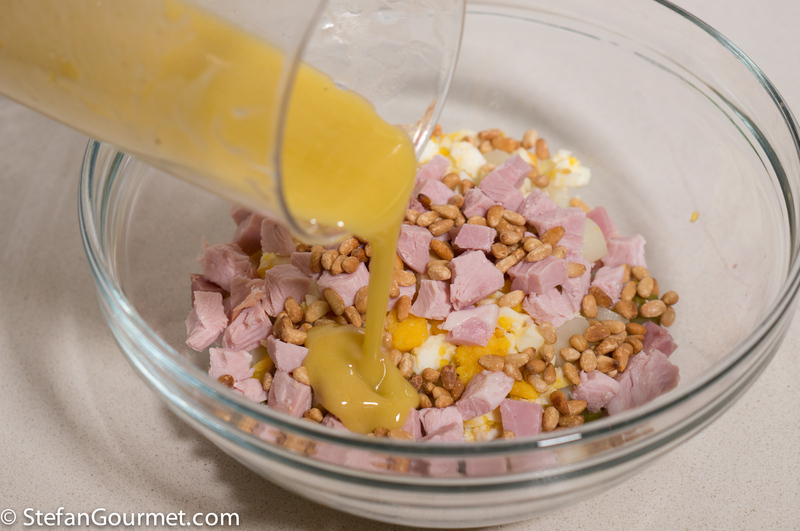 Add two thirds of the vinaigrette. Stir to mix. Taste and add more vinaigrette if needed. 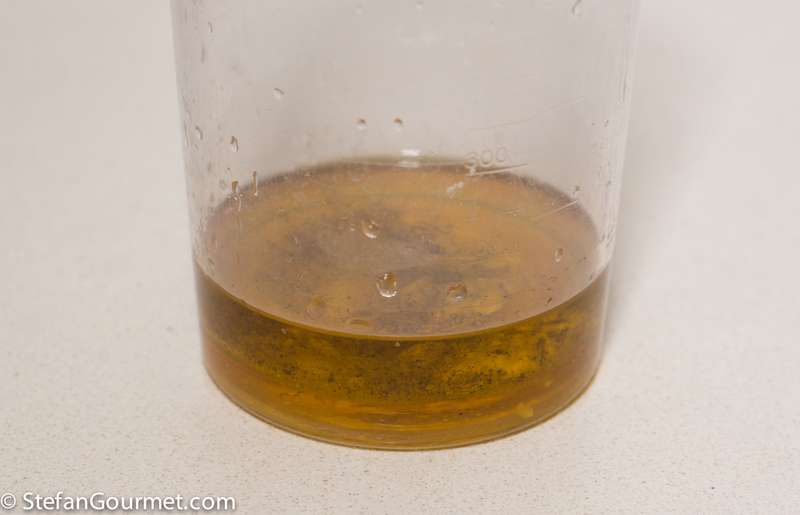 Season the tips with salt, or lightly coat them with some of the remaining vinaigrette. 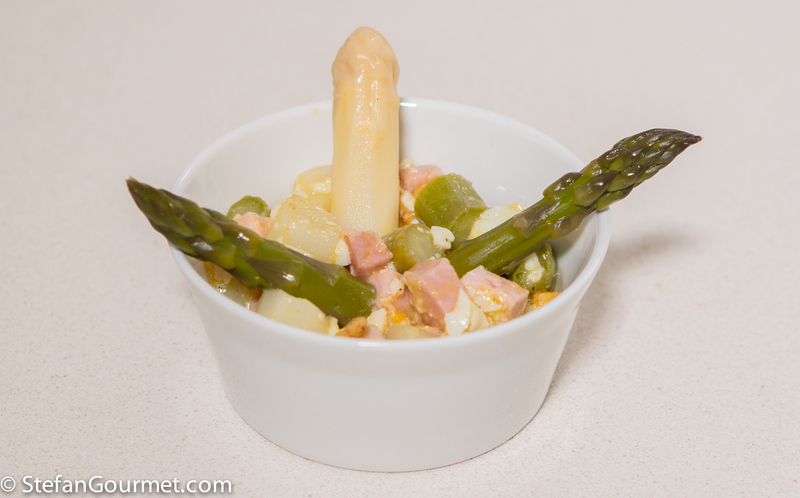 Garnish the asparagus salad with the asparagus tips, and serve. 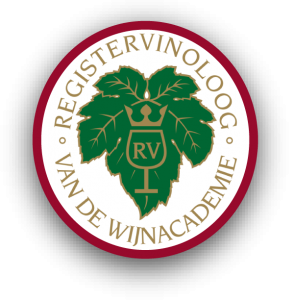 This is great with a sparkling wine that is dry but not too dry, like a cava or prosecco. 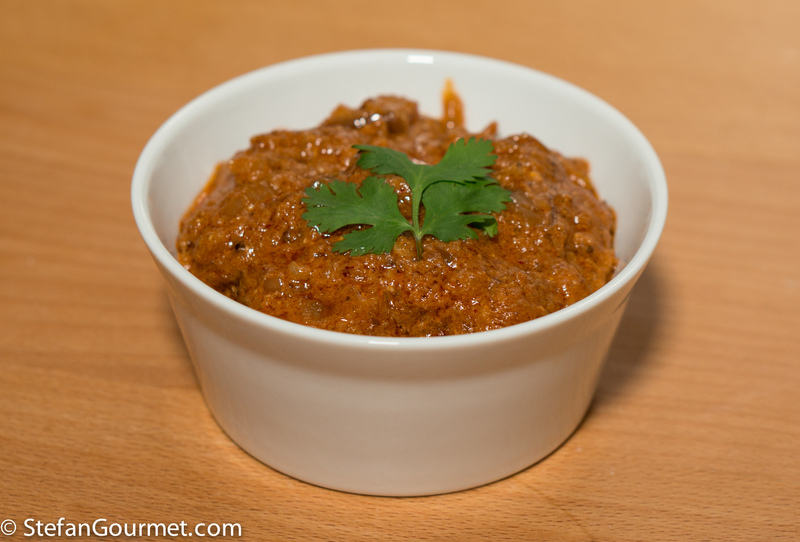 Lamb Korma is an Indian dish with a creamy sauce made with yogurt and tomato. If you are new to Indian food, too, I can recommend this lamb stew because it is simple to prepare, delicious, and you can easily tweak the spiciness to your own preference. Could live off this but usually make it with green asparagus only because of availability here: four months to go for us ! Remember the white from ‘springtime in Germany” Have to try it mixed in the coming spring. 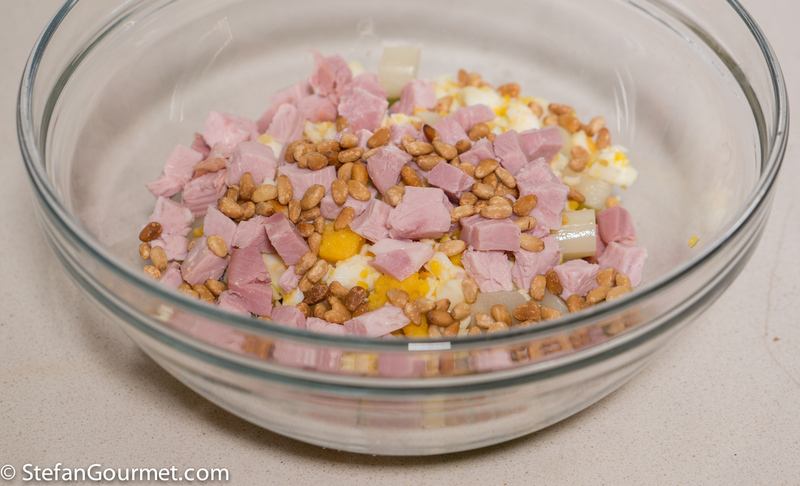 Prepare in the same way sans sous-vide as you would know, but have never used pine nuts: thanks !! Ricetta perfetta per Pasqua (almeno in Italia). Grazie! 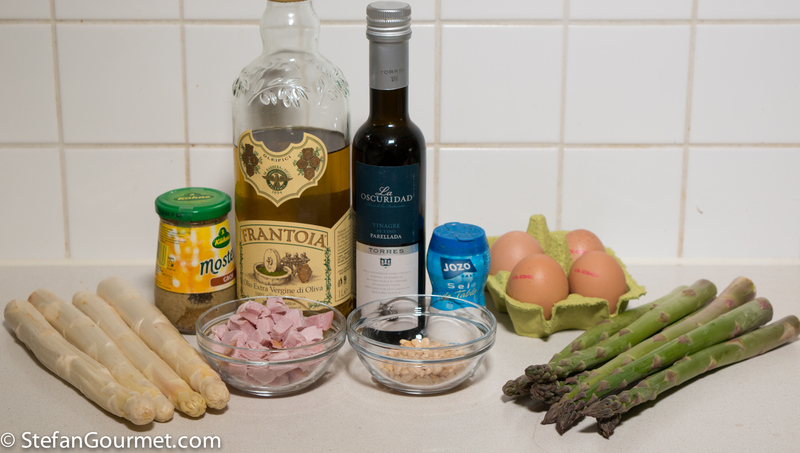 Another delicious idea to use all those seasonal asparagus, thanks for sharing!